Franklin's third novel (after Smonk) is a meandering tale of an unlikely friendship marred by crime and racial strain in smalltown Mississippi. Silas Jones and Larry Ott have known each other since their late 1970s childhood when Silas lived with his mother in a cabin on land owned by Larry's father. At school they could barely acknowledge one another, Silas being black and Larry white, but they secretly formed a bond hunting, fishing, and just being boys in the woods. When a girl goes missing after going on a date with Larry, he is permanently marked as dangerous despite the lack of evidence linking him to her disappearance, and the two boys go their separate ways. Twenty-five years later, Silas is the local constable, and when another girl disappears, Larry, an auto mechanic with few customers and fewer friends, is once again a person of interest. 5 words: I couldn't put it down! What an enjoyable little book!! I am not a fan the "old south and racial problems"... well, not to read them anyway.. I am old enough to have lived through much of it and I don't need reminders of any discrimination. But this book grabbed me and took off like a shot and never stopped. It didn't take long for me to feel for both of these boys/ men, Silas Jones and Larry Ott, and once that happened I had to keep reading to know how things would turn out. If you were a good detective (which I'm not) you'd figure out things faster then I did, but it doesn't matter much because the book just reeks with excellent writing and a story wanting to be told. 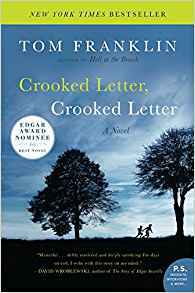 Tom Franklin, wrote in simple words, and wrote just like you could hear a voice telling the story...I am certainly going to have to check on his other books to see if anything sounds interesting, because I really REALLY enjoyed this book. "This first major biography of Dickens in nearly 40 years is a winning mix of insight, narrative skill and shrewd judgment," commended PW. As limned here, "Dickens was convivial, loyal, secretive and arrogant, with a 'performance personality' that required applause for self-definition." When I picked this book up in a used book store for $1.00 I thought "ok, MAYBE one day I will read this".. I couldn't refuse the price! I'm not sure why I picked it up to read when I did, and I fully expected to be bored with it within a few days and lay it aside... but that didn't happen! The author, Fred Kaplan, had an excellent style to make things interesting... and so I read on and on until this morning when I finished it! My mini-fascination with Charles Dickens and Wilke Collins truly began when I read Drood, a historical fiction that made Dickens and Collins both sound interesting and captivating. Since then I read Dickens Christmas Carol (always saw the movie and never read the book), and The Old Curiosity Shop . I also read the Woman in While by Wilke Collins, and a few other fiction books about them both. This Biography, though long, kept my interest. Dickens didn't lead an adventurous life nor was much of his life spectacular, with the exception of his writing of course, but still the book prevailed. The author managed to merge the biggest truths about Dickens writings and that was that most all his writings had some autobiographical touch to them. Often his father was one of the figures in his books and many times he himself drew things from his childhood to write upon. I did learn some small things too, like the fact that Dickens had 10 children. One was a miscarriage though and another died shortly after birth. Actually he outlived most of his other 8 children. I was surprised to find out that he and Wilke had not met earlier in his career, but in fact later, yet still became good friends and even collaborated on some writings. In the book Dickens moves around quite a bit and begins his "readings" of some of his work, which takes him to come across the pond to America twice in his life . He also separates from his wife later in the book. A big thing I noticed in the writing is the feeling one gets for the time and place of where Dickens is ..and how doctors have yet to discover how to care for and cure illnesses. 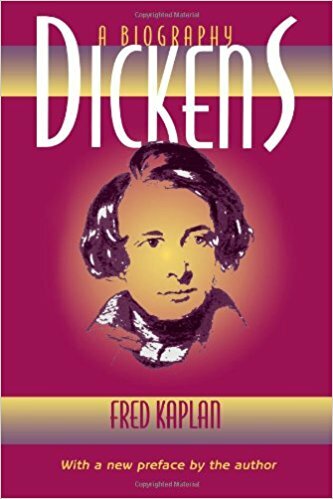 If you want to know about Dickens his biography is a good place to start. But don't pick it up expecting a bunch of "dirty little secrets" or adventure , still I can say I liked the book and I'm glad I read it. I haven't written a meme in a long time, and there are just so many pond photo's I can post before no one comes to my blog, so when I came across this one I thought I'd "steal it" from Daphne . Ummm, that would be "Dead Fred" my, very real Steer Skull. I haven't met a whole lot of people with steer skulls. I have come to really like the name I use for the computer of "DesLily" Other than that I like names that aren't common. my Cafe Vienna. My Computer. My Television. I've always had a lot of White around. I like a man with a good sense of humor. And one that somehow finds some good in everyone. Same as a man actually. probably that new car so I wouldn't have to keep fearing when it will break down. something that would help old people be able to have a better life. The Hobbit .. probablly because it set me off on reading and I've not stopped since. That would probably be Bread. hmmm, maybe pasta of some sort. A cup of Cafe Vienna. Dancing with the Stars. NCIS. Bones. Doctors. But it's not working. When one is old there are ALWAYS doctors! Life is waaaay tooooo short. read some. play on my computer some. watch tv some..
Actually I sent out a written note as recently as a week ago. 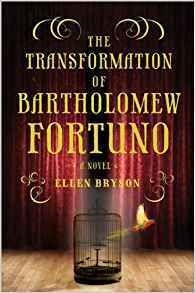 The Transformation of Bartholomew Fortuno by Ellen Bryson. Inspired by a vintage circus photograph, Bryson's first novel tells the fictional story of the unusual relationship between two human curiosities from P.T. Barnum's American Museum. Bartholomew Fortuno, the world's thinnest man, is asked by Barnum to keep an eye on his latest acquisition—Iell Adams, the bearded woman, who is kept in seclusion until the impresario can introduce her to the world. Fascinated by her and desiring a transformative experience, Bartholomew falls hopelessly in love with Iell, much to the surprise of his fellow Curiosities. Bartholomew also gets caught in the middle of a war between Barnum and his jealous wife for control of Iell's future. The story culminates at Barnum's birthday party, where Bartholomew is shocked to discover Iell's big secret. Though thin on plot, this work sympathetically conjures up the backstage world of Barnum's museum and the pecking order of his Curiosities, and magically transports the reader back in time to Gilded Age New York. This is a book one can real quickly. I can't say I loved it but it was a well written story of getting inside "the thinnest man in the world", while feeling somewhat like you are finding out what it was like to be one of Barnum's "freaks". Bartholomew Fortuno was "a side show" like all the others who worked for Barnum, but he saw his "thinness" as a gift, so he could show others and teach them. But the truth is that the story is really about how Bartholomew fell in love, lost his friends, but found the truth about himself. I don't want to give too many details or I'd ruin the book for anyone who might want to read it. The disappointing side was that it was a little on the boring side and I didn't get a full feeling of "where I was", or how New York looked like back then. One of the few references to the timeline was that President Lincoln was murdered. But, as I said it wasn't a bad read and it had that one unexpected twist near the end of the book that was nice. If you ever wanted to delve into a persons life because they were "different", this book does just that. I am happy that in the first 3 days of January I actually finished a book! However, if I keep reading the book I thought I'd flip thru to see if I want to read it next, it could take most of the month to get thru it!! I'm not sure I'll continue it but I may! It's the Biography of Charles Dickens. I'll decide today if it's the chunkster or another book !